The first day, we saw some of the moai that are located close to town – in fact, they are right in front of the Mana Nui Inn (we could see some from our balcony!). We saw Ahu Tahai, Ahu Akapu, and Ahu Tautira. It was a great introduction, and took only 2 hours at a leisurely pace. The jeep we rented from our hotel. With the help of a rental car the next day, we were able to see most of the moai. Although we saw some people walking the sites, or biking, we would recommend against it. The distances to get to the best sites are considerable. Unless you are planning to spend a week, we doubt you could fit everything in. We arranged the rental car from Mana Nui Inn – it was a 4×4 jeep, in good condition. No A/C, but it’s really not needed for Easter Island. Standard only, I’m not sure if there are any automatics on the island. It cost us $60 US/day. Apparently you can find $50/day in town, but it was more convenient to get it from our hotel. Almost all the moai can be seen by driving around the ring road around the island, which is paved (except for a few km). We did a nice short hike up the volcano at Rano Raraku for a nice view of the eastern part of the island. Rano Raraku is the "Moai Nursery". It is thought that most of the moai were carved out of the volcanic rock here, and many can still be seen in place on the mountain, at various stages of construction. It was one of the highlights of all the sites we saw. Right next to it, Ahu Tongariki, is the most impressive display of moai. The other must-see ahu for us was Ahu Akivi, which is the only ahu where the moai are facing the ocean, instead of towards the land. The beach at Anakena is also well worth a visit. 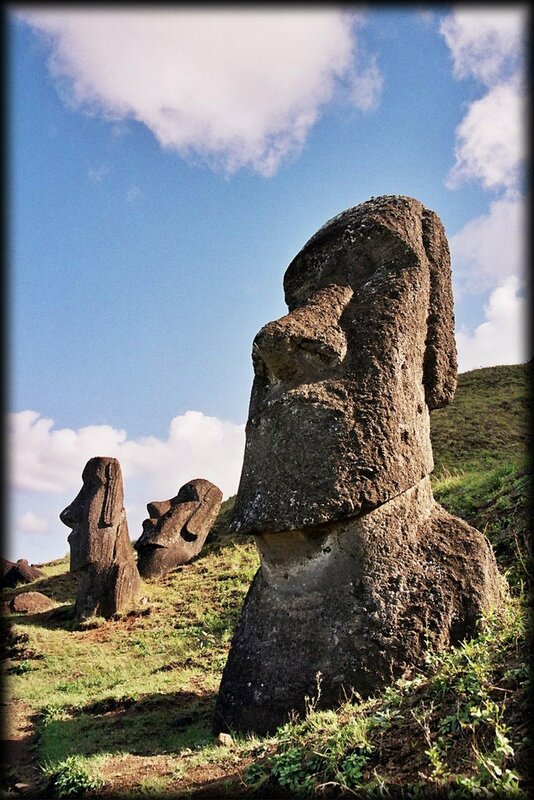 There is an impressive set of moai overlooking a beautiful, sheltered beach in a bay. It is the only place we saw outside of Hanga Roa selling drinks/refreshments. 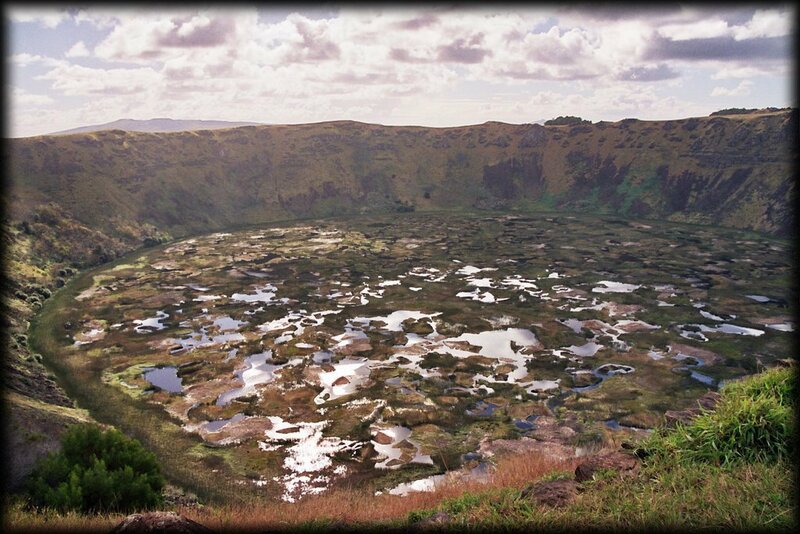 Rano Kau is a crater at the tip of the island. (Extinct volcano). It is 1600 m across and 200 m deep. We also visited the Orongo Ceremonial Village, which was a bit of a disappointment (we spent more time talking to the guy at the ticket booth than we did at the site.) However, the drive up to the village, as well as the views of the volcanic crater of Rano Kau, definitely made it worthwhile. There is an island they used to swim to as part of the Birdman Cult. You can see the islands of Motu Nui, Motu Iti and Motu Kao Kao – just off Cabo Te Manga. The last ceremonies actually took place fairly recently – ending in 1866. The museum Museo Anthropologico Sebastian Englert is a small two-room museum north of town. If it turns cloudy, it’s a good thing to check out, with a good background on the history of the island. Make sure to ask for the English binder to provide translations of the signs. We ate at two restaurants during our time on the island. Our first dinner was at Jardin del Mau on the seaside, which offered pasta, a great vegetarian option on the island. Wendy was very happy with her meal, but my mahi was not worth the price. Our second meal was at Kai Mana in town, which was also quite good, with a very friendly owner. We also snacked on empanadas, (like a pastry sandwich, which is fried). We had a great time on Easter Island! Everyone we met was very friendly and kind. It made the stay a real pleasure.